Let the dance of life begin: Yes this is addictive! I see why they say blogging is addictive. I really am looking forward to a healthy head of locks so I pretty much have the same hair style all the time (: unless I use a head band. I have invested in a few I have actually had to restrain myself on some occasions as all I want to do is buy head bands. 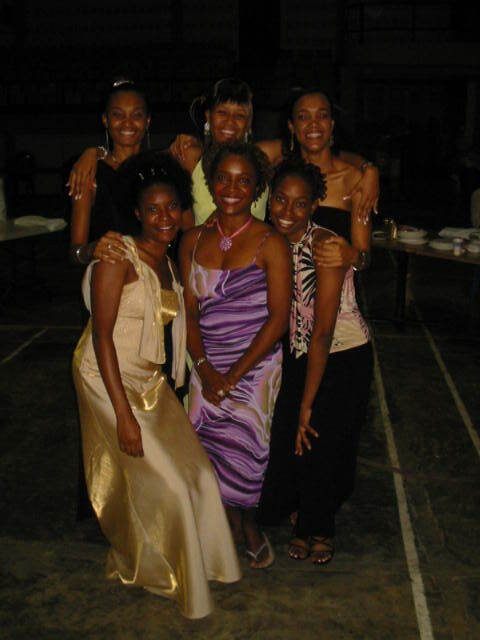 Although you cannot really see it in this pic I was wearing a beaded one(: This pic was taken on the 17th of December 2005 at dinner thet was held at the university I attend. I am in the middle(: me, some of my friends and collegues. I should add there are 4 out of 6 natural heads. Are you gonna keep coloring it as it grows out? Just curious.